There is no denying that moving from one home to another can be a very chaotic time. Not only is there the upheaval of packing up our homes, there are also so many details to keep track of and a to-do list that can feel like it never ends. It’s the nature of the event. The good news is that there are steps we can and things we can do to help limit just how chaotic our move will be. One of those things is creating a move planner to help track all those to-dos and details we don’t want to forget. 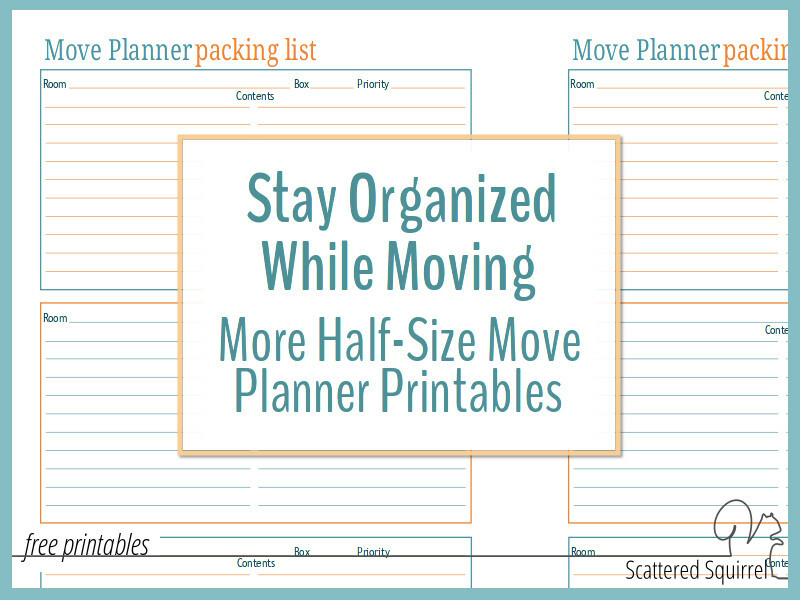 Today, I’d like to share a few more half-size move planner printables to help you do just that! Last week I shared half-sized move planner printables to help organize your house hunting and the beginning stage of a move. Today’s printables focus a little more on the practicalities of moving. Keeping track of little details that are easy to forget in the flurry of activity that moving usually brings with it. The first printable I’m sharing today is one that saved the day for us during our last move. We were at the old house finishing the packing and loading the truck. I was going through my checklists and other pages to make sure I wasn’t forgetting something. It turns out I had forgotten something pretty important – hooking up the electricity and heat at our new home. If I hadn’t had the Utilities and Services printable, I wouldn’t have realized it until we were already at the new house. The Utilities and Services printable was designed so that all the information needed for each account is right at your finger tips. From the company’s phone number to what the connection fee will be, it’s all here. I used this for everything, even our cell phones and magazine subscriptions. It acted as a change of address tracker in addtion to being a utilities and service resource. Next up was the star of our last moving show – the packing list. Room – jot down what room the box belongs in so you know where to find it. It’s also a good idea to mark the room on the box itself, so it doesn’t get lost. Box – I numbered all my boxes. It was the only way I could think of to easily link the list to the box. This turned out to have many other side benefits I didn’t foresee. It allowed me to start packing really early, but still keep things organized for moving day. Loading and unloading the truck was more efficient because the boxes were numbered we knew which ones we’d need first at the new place. It made it super easy to find a box to get to an item on moving day. Priority – this is spot can be used to mark high priority boxes, or designate thing to storage. I can’t stress how much this printable came in handy during our move. We were able to find the things we needed or that the boys wanted without having to open up a bunch of boxes and create more mess and chaos. It also made unpack so much easier. I was able to got room by room and unpack the necessities for each room the day we moved in. So all our rooms were functioning before dinner time that night. 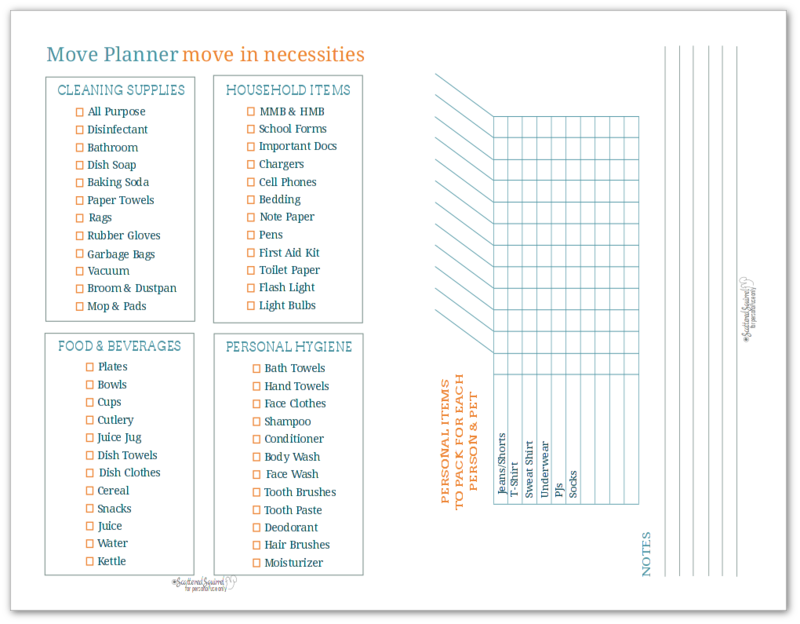 The next printable in my move planner was the move in necessities checklist. This checklist is great for making sure that you have everything you need for a day or two when you move in. From cleaning supplies to personal items, there’s a spot for all the necessities on this list. These items are the last things packed and the first items to come off the truck. This way you have peace of mind knowing you don’t have to start digging through boxes right away. 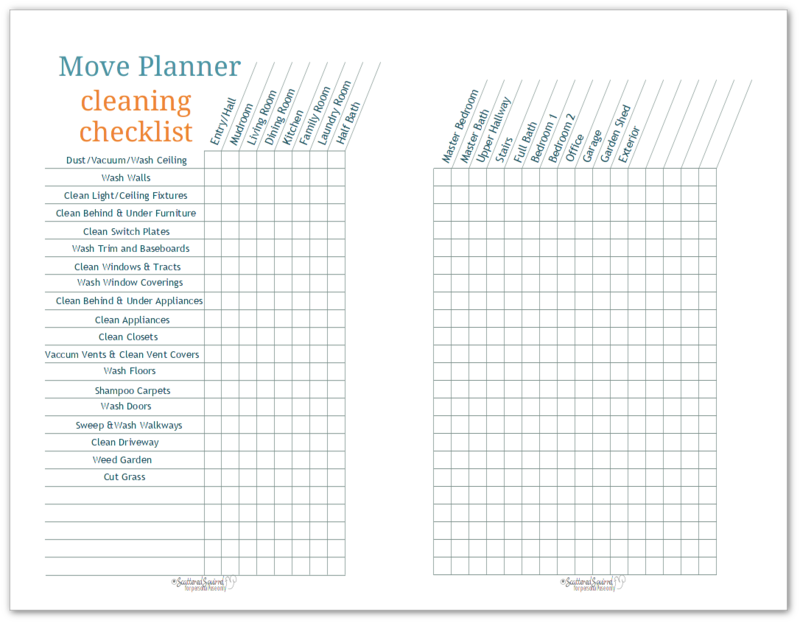 Last, but certainly not lease, the cleaning checklist. I printed two of these – one for our old home and one for our new one. For the old home I wanted to make sure I left it super clean and fresh for the people moving in. For the new home, I went through each room and crossed off the items I didn’t need to clean so I could tackle what needed to be cleaned while the boys unloaded the truck. 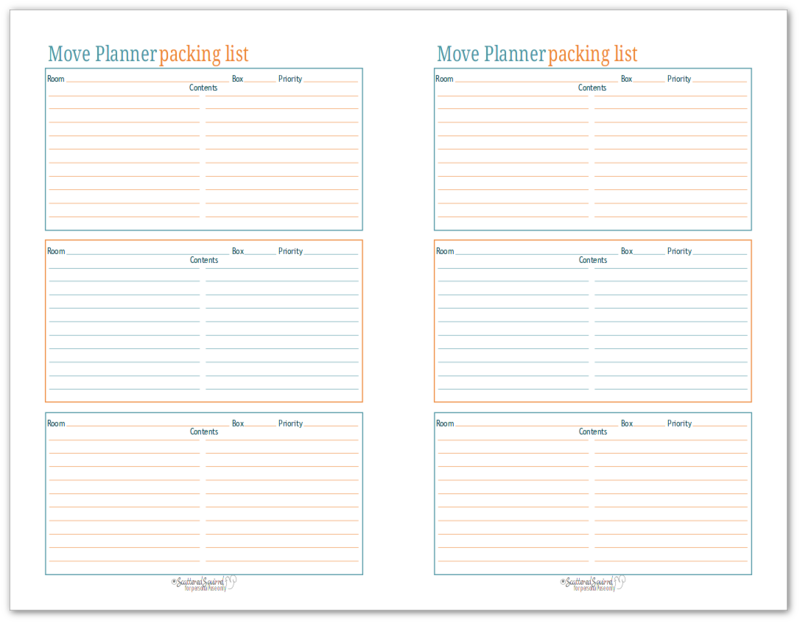 All of these move planner printables serve a purpose and help to add a layer or organization to a naturally chaotic time. Many of them just serve to help us get things out of our heads and onto paper. No need to think about what needs to be cleaned, there’s a checklist in your move planner that is keeping track of all that. 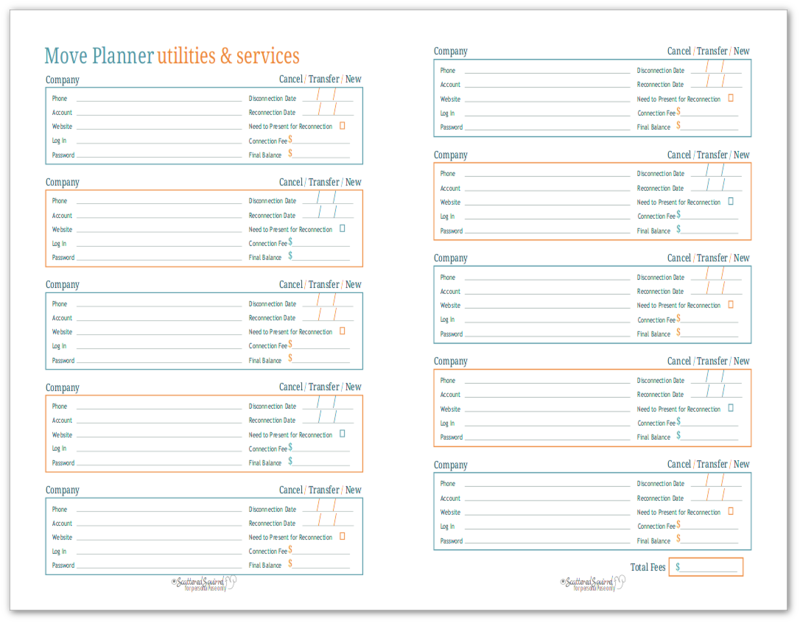 No need to try to remember which companies you need to call to move services, it’s all written in your planner. Having a place where these lists and details are kept can allow you to focus on other things, like packing and enjoying the adventure of moving into your new home. Are you moving soon? Do you have any tips or tricks you’d like to share? Drop a line in the comments below and let us know! I’m not exactly planning to move soon; but as part of a decluttering project, I’m trying to visualize myself moving. What would I want to pack up and haul to a new home if I needed to? These checklists should help me prioritize as I downsize. Thanks for all the great printables–I struggle to stay on track with everything, and your planner printables help tame the chaos by getting stuff out of my head and onto paper. Happy summer! That is a great way to think when decluttering. I’m much more ruthless with my stuff when I’m moving. I’m thrilled to hear that you’re finding some printables to help you, that totally warms my heart. I wish you all the best in your decluttering journey.